Tall skyscrapers make up the city skyline of Montreal, Quebec in Canada with the St. Lawrence River adorning the backdrop. 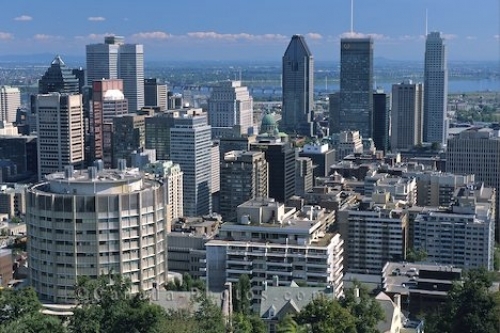 The downtown core of Montreal, Quebec in Canada has many tall buildings that are homes to many professional business offices which makes up the fast paced city streets. Standing at Mount Royal Park in Montreal, the view is spectacular and you can see across the horizon to the St. Lawrence River. Downtown Montreal city, Quebec, Canada, North America. Picture of the downtown city skyline of Montreal, Quebec in Canada from Mount Royal Park.